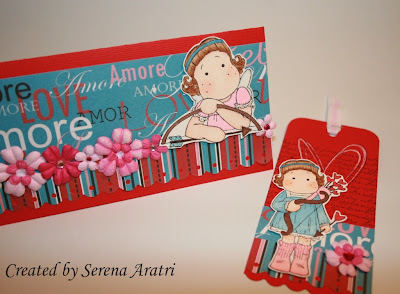 Ho lavorato un pò per S.Valentino...ihih, questo è un progetto veloce che vorrei mostrarvi...una card con una tasca che contiene un segnalibro coordinato! 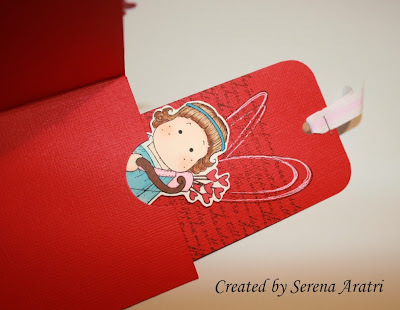 I worked a lot for Valentine's day...ihih, this is a quick project I'm happy to show you....a card with a pocket that has inside a coordinated bookmark! Materiali/Materials: Carte/Papers: Bazzill, Hobby di Carta. 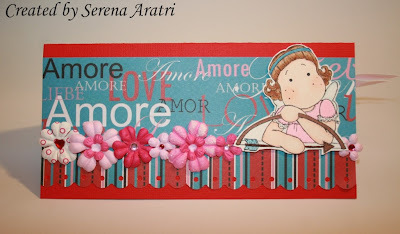 Timbri/Stamps: Amor Tilda, Cupid Tilda (Love Collection 2009), Sfondo/Background (Spring 2007 Valentine & Congratulations Collection). Prima Flowers (Iced), Copics. 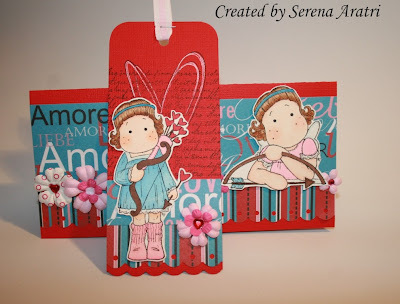 Love your card and bookmark! Brilliant idéa! The colours are gorgeous and your design is beautiful! Oh my Serena this is absolutely wonderful! 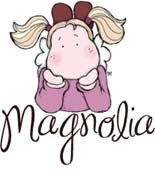 I so love these images and your designs are gorgeous!